I’m sorry the blog has been more silent than usual lately – that’s changing, starting now. I’ve been quiet mostly because I’ve been climbing, and I have a ton of exciting moments to share! The #100Summits journey has taken me halfway across Japan, 1,100 kilometers north of Tokyo, to the northernmost major island, Hokkaido. (If you watch the news you may have seen that the island was rocked by a massive earthquake a little over ten days ago – just two days before my planned arrival.) So far, I’ve attempted–and summited–five hyakumeizan peaks here in Hokkaido, with the help of some amazing guides from Hokkaido Nature Tours. Hokkaido can be difficult to access, even in the absence of major natural disasters, and I knew if I wanted to make these summits happen, I needed a little help. An admission: I’m not a “tour person.” I normally prefer to make my own arrangements, travel light, and see things off the beaten path. That said, Hokkaido Nature Tours (or HNT) specializes in both standard tours (you can see a few on their website, and they actually all look pretty cool) and custom tours–which is the option I needed, and chose. So far, I’ve had three different guides, climbed five different major peaks, visited everything from live volcanoes and onsen to dairy farms, and seen a spectacular array of native animals, including endangered pika and a tanuki, in the wild. This trip has exceeded my expectations in every possible way (and if you’re planning a trip to Hokkaido, I strongly recommend that you contact HNT to be your guides). In the days and weeks to come, I’ll be sharing tons of stories and photos from the climbs and my other adventures. To kick it off, I’m at Murder is Everywhere, sharing the story of my fantastic afternoon at the traditional horse races in Hokkaido. 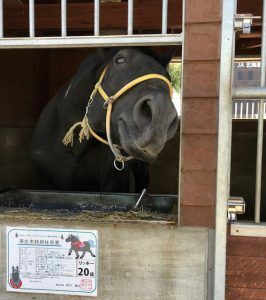 Click through for the story – horse racing here in Hokkaido isn’t like Western racing, as you’ll see!